Society columnist Malu Fernandez of the Philippines, in her now-controversial People Asia article “From Boracay to Greece,” insulted overseas Filipino workers (OFWs) that she encountered in a plane trip to Greece. Ellen Tordesillas’ blog reposted a report on the launch of “Trillanes, Paglingkurin!” movement, which included former Vice President Guingona and former UP President Francisco Nemenzo. But who is and what makes a Filipino? For many of us, being born a Filipino citizen is the key. For some, just tracing your roots to one Filipino makes you one. As for me, citizenship is earned, not laid out on a silver platter. We work to earn the title of being true blue Pinoys. Defining the Filipino is still a challenge for most of us but one thing I am certain, it’s not just ancestry or bloodline or eating adobo that defines us. 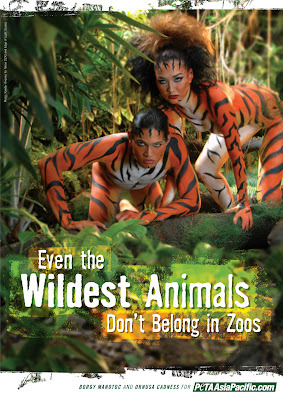 Manila — Posing in a jungle setting with their naked bodies covered only with painted-on tiger stripes next to the tagline “Even the Wildest Animals Don’t Belong in Zoos,” top Filipino models Ornusa Cadness and Borgy Manotoc appear together in the first of a series of three ads for People for the Ethical Treatment of Animals (PETA) Asia-Pacific.